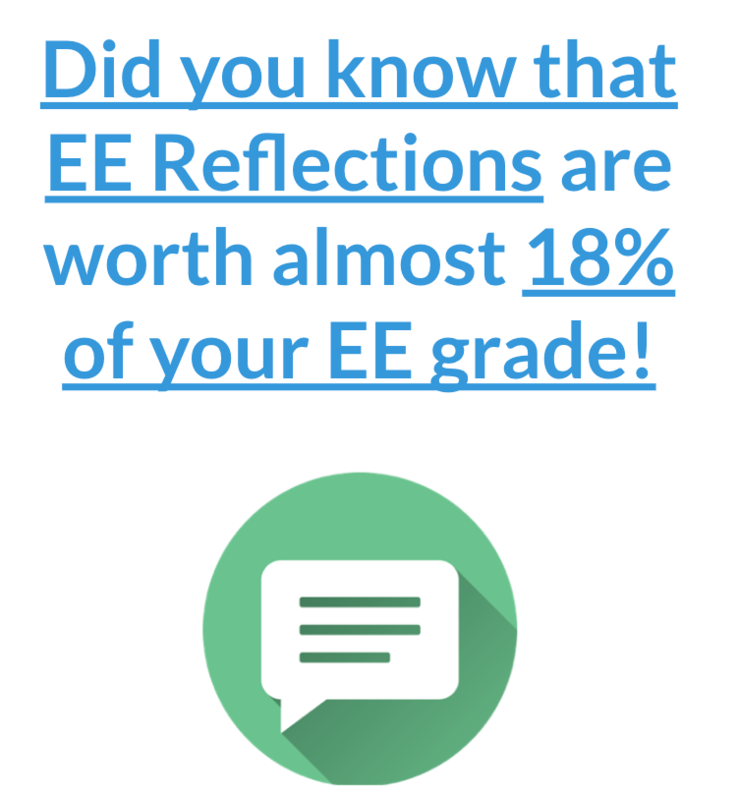 In this post, I wanted to share with you a resource straight out of latest online course: Business EE Mastery. I know a lot of you are working on your Extended Essays at the moment, so I thought you'd probably appreciate some extra help. You need to know how to get the information you're looking for quickly and also, be willing to think about what you're looking for. Normally people look for the wrong information. Wrong information is information that has nothing to do with your research question. And EE students use information like this all the time. You can use some information that doesn't really relate to your RQ (for example when filling out a SWOT analysis), but you want to get and use as much highly-relevant information as you possibly can. I've already talked to you about using a variety of research sources. That is a big part of this. It really is worth spending some time exploring different types of sources --rather than just the first page of Google results. Is it going to help us improve our market share? For another business, they might be more interested in improving their efficiency, or brand image. The sub-questions help you focus your research and make sure you're seeking out information that is relevant. Sub-questions also help you justify the tools you're using. If "Can we afford this" is an important question, there are ratios you can use to convincingly answer that question. Librarians often have master's degrees in being librarians. Seriously. That's an actual thing. The degree is all about how to provide assistance to people like you. I myself have 3 university degrees already. I edit academic papers for Economists. And, I ask librarians for help. They simply know things about how their computer systems work that I don't. If your High School library isn't so sophisticated to need any help from a librarian to navigate, get yourself to a college campus or to the biggest library in your city and ask the librarians there for help. Honestly, you'll be impressed by helpful they can be. Everyone knows you shouldn't use Wikipedia as a source, but you can normally use the sources that Wikipedia cites at the bottom of their pages. The Wikipedia article on Singapore cites 355 (!!!) 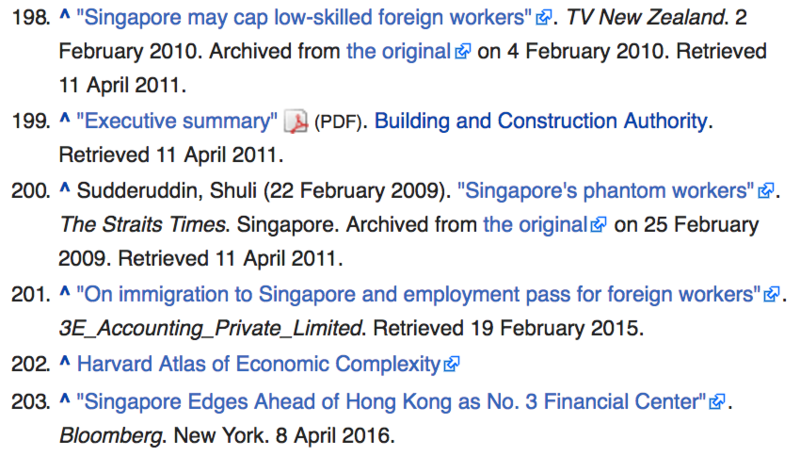 different sources and then it also shows a whole list of "External Links" --general information on Singapore: profiles from the BBC, economic forecasts, etc. This is great information. It's already organised and the Wikipedia people have probably made sure these links are reliable. You can use the sources of your sources just as easily for an academic article you find on Google Scholar. Professional researchers are so careful about the sources they use. They're not going to base their findings on junk. If you can find an article that's very much related to thing you're researching (i.e. "Prospects for Organic Food production in Italy" --or whatever you're studying you'll find a goldmine in the Work Cited area. I've explained the value of proxy data in this article I wrote on my website --which is worth a read. Basically, sometimes when you're trying to find good information about one thing you can't find it. But you could find something very similar and use that. For example, if you need to know about Smart Phones sales in Ecuador, you could use information about Smart Phone sales in Peru. Just mention that Peru has twice the population of Ecuador and that "their might be other reasons that this data might not be a reliable indicator" and you're done. You now have an indicator of how Smart Phone sales might be in Ecuador. There are a lot of ways you can do this. For example, you can use information about how one organic food item has done and use that as an indicator of how another one might do. And, even if you're not going to use proxy data, often you can ask a slightly different question (i.e. in your Google search) to get some really valuable insights. Your question could be either more general or more specific, or you could look at a different aspect of the problem (liquidity, rather than gearing for example). The possibilities are endless. Just try to look at it from a different perspective. Everyone thinks they know how to do a proper Google search, but some people are really good at it! 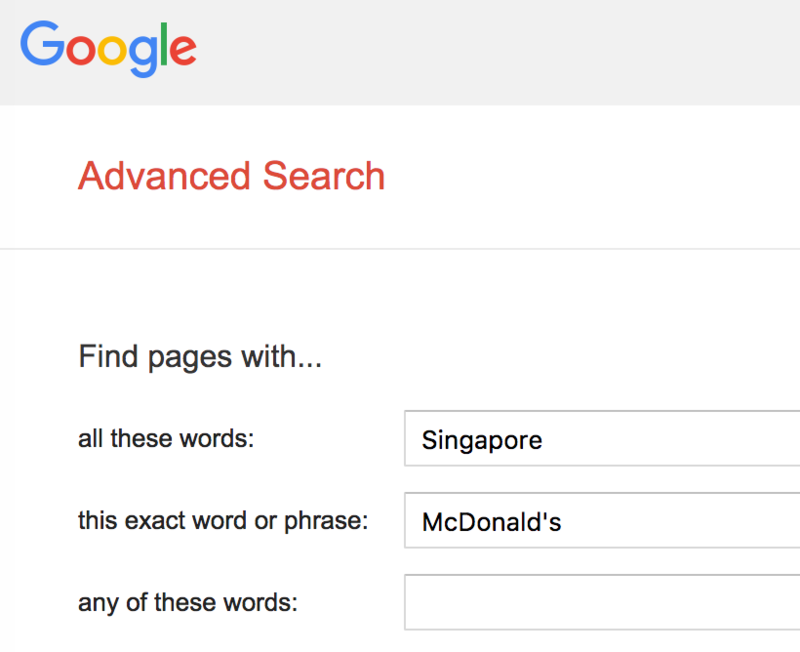 Google's Advanced search will help you narrow down your search. You can say you only want to see PDF's related to your search term and this might show you some academic or industry articles you can use. Or, you could specify that you only want recent articles. Or you could specify that you only want .edu sites, for example. Remember, while you're Googling, don't forget to look up the trade journal for your industry. Business owners pay sometimes $2000 a year just for 2 or 3 of these magazines each year because they're filled with secret research about the industry. The people you interview (i.e. at the company) are really knowledgeable, but they're going to talk to you like you don't know much if you haven't done your homework. Go in their asking, "So, hey, ummm... how's the business these days?" and you won't learn much. Instead ask them why they think the ROCE has decreased by 21% in the past year, while the gearing has increased by 3%. Try to save at least one major interview for the point when you're at least 3/4 done your secondary research. This is a good idea for about 10 different reasons. You'll be able to ask really insightful questions. You'll already know what's important to you and to your RQ. And you'll probably get offered a job too! :) Right? They'll just be blown away that a 17 year old can know so much. Find out what this person thinks the problem is. Find out what they think the future of the company is. Use this as prep for your career. Ask the questions you want answers. Again, if you're interested, you can try-out my Business EE Mastery video course online for free at the moment. If you're happy doing it on your own, this page has some more really good tips to help you at this stage.